On December 7, 2017, President Donald Trump courageously shook the foundations of modern history by announcing the United States was (finally!) moving our embassy to the capital of Israel, Jerusalem. It would be easy to pass these oddities off as silly or bizarre decisions, but nothing could be further from the truth. Since the founding of Israel 70 years ago, the international community has been in some stage of ferocious uproar regarding every little aspect of the Jewish State. Just two weeks after President Trump’s announcement to move the embassy, the United Nations convened a General Assembly vote simply to denounce and demand a rescinding of America’s decision. The resolution passed 128-9! Why does this ancient city incite such an uninhibited rage from governments all over the world? I will tell you why – in 2 Chronicles 6:6, the Lord says, “I have chosen Jerusalem, for my Name to be there.” There is no other city in the world that God has chosen to place His name upon. WHY IS THE LORD SO PASSIONATE ABOUT THIS CITY? AND WHY, IN THIS MIRACULOUS 70TH YEAR OF ISRAEL’S MODERN EXISTENCE, SHOULD YOU ALSO BE PASSIONATE ABOUT JERUSALEM? Isaiah 2 tells the future story of the magnified city of Jerusalem, which is higher than any other city. In verse 3 the Lord says people from all the nations will go up to the House of God, and the Word of the Lord will go forth from Jerusalem. See, Jerusalem is not just another city, and these prophetic promises of God have not been replaced, fulfilled, or become irrelevant. Jerusalem is an eternal city. It is a place where God first made a permanent dwelling for His glory, and where – through the return of Yeshua (Jesus) to a physical Jerusalem (Zech. 14:4) – He will dwell on earth for eternity. 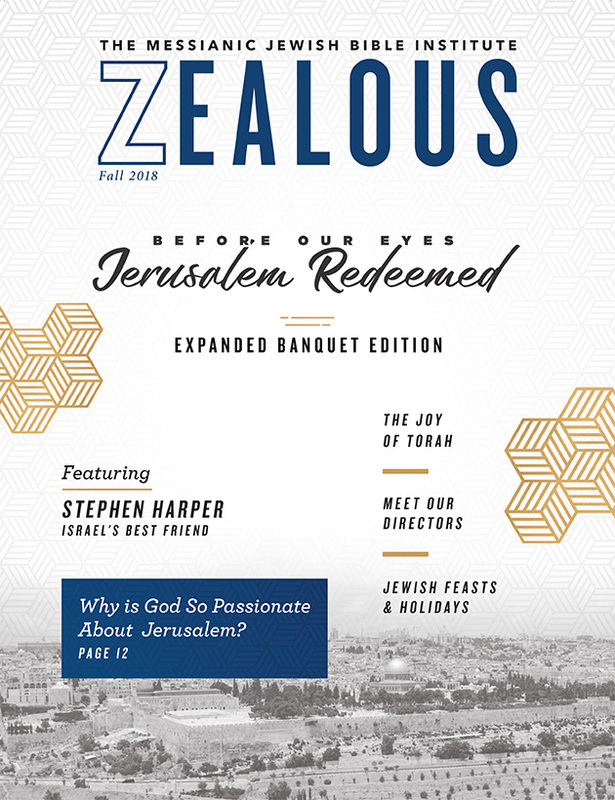 When President Trump became the first major international leader to recognize that Jerusalem is the capital of the Jewish State, he was simultaneously aligning with the truth of God’s Word, which places utmost importance on Jerusalem being the focal city of God’s forthcoming kingdom. Can you believe that we are living in a day where these ancient Scriptures are being fulfilled? Through a unique man named Donald Trump, God has demonstrated His holy power before the eyes of all the nations. And, just as Scripture promises, the nations are raging as His ancient promises are coming true (Psalm 2). There is so much more I could write about this, but I am saving my energy to share it with you in person on November 15, 2018. We are living in one of the most supernatural times in human history, friends. You are going to find out much more when you join me and the notable world leader, former Prime Minister Stephen Harper, for a life-changing evening this fall! WHY ATTEND THE MJBI 2018 BANQUET? Hear from world leader and vocal defender of Israel, former Prime Minister Stephen Harper. Get inspired to be an informed advocate of Israel and the Jewish people. Meet and form a strong connection with like-minded supporters of Israel. Learn what’s been accomplished in 2018 and hear about what’s ahead for MJBI.